A group blog about computer narrative, games, poetry, and art. Thanks to past GTxA hosts: the Center for Research in Computing and the Arts and the School of Literature, Communication, and Culture. is the shortest way to get to this blog. HANOVER, NH– Tiltfactor, creators of Buffalo: The Name Dropping Game, have announced the debut of Buffalo Facilitator’s Workbook: A Guide to Leading Conversations to Reduce Implicit Bias. The workbook takes Buffalo, a fast-paced party game, and turns gameplay into a workshop that organizations can use to facilitate what can sometimes be difficult workplace conversations. This is a preview of Buffalo Facilitator’s Guide Debuts on Amazon . Read the full post. During Synchrony 2019, on the train from New York City to Montreal, two of us (nom de nom and shifty) wrote a 64 byte Commodore 64 program which ended up in the Old School competition. (It could have also gone into the Nano competition for <=256 byte productions.) Our Alphabit edged out the one other fine entry in Old School,a Sega Genesis production by ModeDude also written on the train. This is a preview of A Bit about Alphabit . Read the full post. The second issue of Taper, a literary magazine featuring small-scale computational work, is now online. The second issue was edited by Sebastian Bartlett, Lillian-Yvonne Bertram, Angela Chang, Judy Heflin, and Rachel Paige Thompson, working collectively. Bad Quarto (my micropress) publishes the journal. The call for issue #3 is posted. The deadline is February 18 (2019). Taper #2 features 18 works by six a., Sebastian Bartlett, Kyle Booten, Angela Chang, Augusto Corvalan, Kavi Duvvoori, Esen Espinsa, Leonardo Flores, Judy Heflin, Chris Joseph, Vinicius Marquet, Stuart Moulthrop, Everest Pipkin, Mark Sample, and William Wu. Go take a look! We’re trying to get into the habit of posting about all our publications, so here’s a post about the two things (one poster and one demo) I just got back from presenting at ICIDS 2018 last week! This is a preview of Two new publications at ICIDS 2018 . Read the full post. 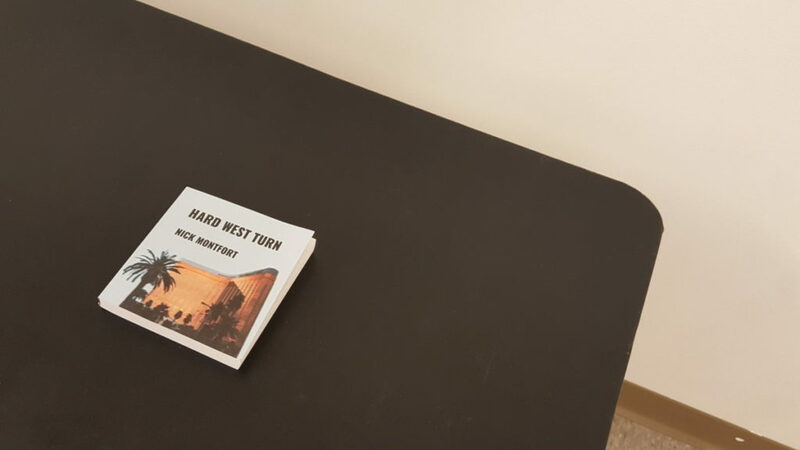 For two weeks only (today through October 23), my limited-edition computer-generated book, Hard West Turn, is available for reading in an installation at Time Farm, underneath the MIT Press Bookstore, 301 Massachusetts Ave, Cambridge, MA. 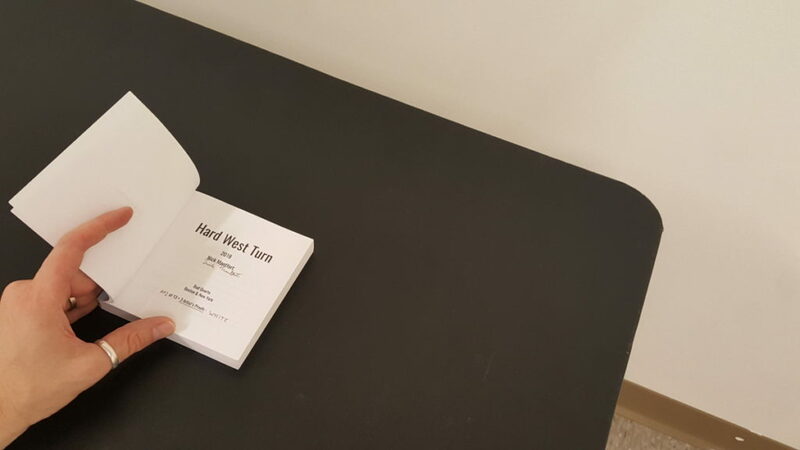 Hard West Turn is a computer-generated novel about gun violence in the United States. The copy exhibited is one of three artist’s proofs; only 13 copies (one for each of the original states) were made for sale. The generating program is free software, but the specific copy-edited text of this book has only been made available in print. Hard West Turn will be regenerated annually for limited-edition publication each July 4. This is a preview of Hard West Turn at Time Farm . Read the full post. At the recent ELO conference in Montréal Leonardo Flores introduced the concept of “3rd Generation” electronic literature. I was at another session during his influential talk, but I heard about the concept from him beforehand and have read about it on Twitter (a 3rd generation context, I believe) and Flores’s blog (more of a 2nd generation context, I believe). One of the aspects of this concept is that the third generation of e-lit writers makes use of existing platforms (Twitter APIs, for instance) rather than developing their own interfaces. Blogging is a bit different from hand-rolled HTML, but one administers one’s own blog. This is a preview of A Web Reply to the Post-Web Generation . Read the full post. Thanks to host Joseph Mosconi, I read at the Poetics Research Bureau in Los Angeles from two recent computer-generated books. Sophia Le Fraga and Aaron Winslow read with me on this evening, on July 21. 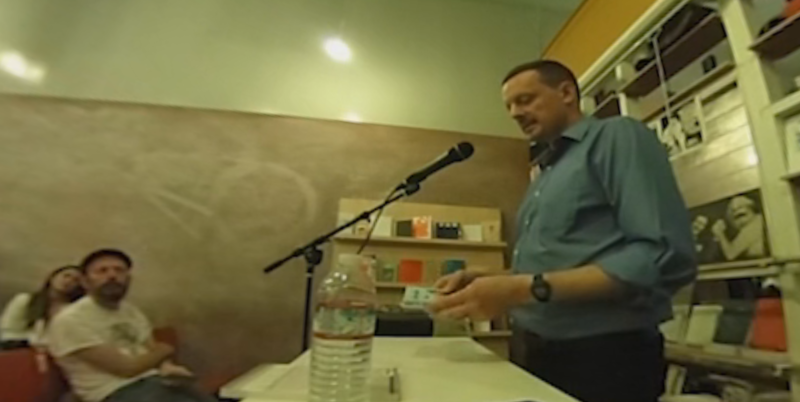 I have now posted 360 video of my readings of both The Truelist and Hard West Turn. I read from The Truelist (Counterpath, 2017). The Truelist is available as an offset-printed book from Counterpath, as a short, deterministic, free software program that generates the full text of the book, and as a free audiobook, thanks to the generosity of the University of Pennsylvania’s Kelly Writers House, its Wexler Studio, and PennSound. This is a preview of VIdeo of My PRB Reading . Read the full post. The Platform Studies series from MIT Press is now about ten years old. The first book in the series, my & Ian Bogost’s Racing the Beam: The Atari Video Computer System, was published in 2009. (We also edit this series.) Before our book on the Atari VCS/Atari 2600 came out, we launched the site and announced the series, back at the end of 2006, and Ian and I were presenting about it at conferences the next year. So, although the exact birthday is uncertain, let’s say a (probably belated) happy 10th. This is a preview of Platform Studies at 10 . Read the full post. This is a preview of Exquisite Corpses are Now on Display . Read the full post. David Byrne’s earworm takes a distant yet close perspective, describing a bullet’s fatal encounter with a human body. Did he know about Kaplan’s similar short, rapid, book-length poem? Byrne’s song sets its sights on an adult man, Kaplan’s poem on a child. The life of the child is hinted by describing what a warm maternal relationship is like, and by mentioning injuries from falling off a bunk bed and being hit by a baseball. We hear about the man’s life because of what the bullet cuts through: “Skin that women had touched,” “Many fine meals he tasted there,” “his heart with thoughts of you.” The general description is very effective. There are striking metaphors — positive associations — for the bullet itself, also. In Poem, it is a triumphant runner (such as Usain Bolt, who bears the name of a crossbow’s projectile) dragging gore from the body as if it were a trophy or banner. In “Bullet,” it is “Like an old grey dog / On a fox’s trail.” Perhaps America’s reliable old dog cannot be taught new tricks. This is a preview of “Bullet” and Poem without Suffering . Read the full post. I’ll be presenting my new paper, Gardening Games: An Alternative Philosophy of PCG in Games, at the PCG Workshop at FDG 2018. Procedural content generation (PCG) in games is often framed as a way to feed the content furnace, satisfying the voracious appetites of players by generating infinite seas of content for them to consume. Although this dominant framing provides a clear structuring purpose for PCG research, it also unnecessarily limits our vision of alternative purposes that generative methods might serve. Furthermore, generative systems designed with this purpose in mind may tend to reinforce certain problematic dynamics in game design. In this paper, we draw a contrast between two approaches to procedural terrain generation and the dynamics of play they tend to enable, which we term mining and gardening. We then extend this analysis to PCG more broadly and suggest that the latter (gardening) dynamic represents a viable and compelling alternative philosophy of how generative methods can be used in games. This is a preview of New paper: “Gardening Games: An Alternative Philosophy of PCG in Games” . Read the full post. I’m pleased to announce the release of the first issue of Taper, along with the call for works for issue #2. Taper is a DIY literary magazine that hosts very short computational literary works — in the first issue, sonic, visual, animated, and generated poetry that is no more than 1KB, excluding comments and the standard header that all pages share. In the second issue, this constraint will be relaxed to 2KB. This is a preview of Concise Computational Literature is Now Online in Taper . Read the full post. Khevna Joshi, blogger and game designer at Tiltfactor, won this year’s Dartmouth Student Employee Contest in the category of academic/professional impact. Below is her essay on how Tiltfactor helped her build skills and knowledge to develop her resume! “So, what types of games do you like to play? Board games, card games, digital games?” I asked. This is a preview of On Khevna Joshi, Blogger and Game Designer . Read the full post. Tiltfactor: Hey Nick! Can you tell us a little bit about yourself and the work that you are doing in the Tiltfactor lab? Nick: I am a Dartmouth ‘21 and I have been working at Tiltfactor since fall of this year. Currently, I work as a Tiltfactor Fellow. My role is similar to that of a lab intern, but I’ll be working more closely with Max and Mary to develop new games this term. My background is in computer science and graphic design, so I mostly contribute to the coding and 3D modeling required for making some of our games. Right now, I’m working on a couple of different projects: a phone game code-named Potions and a new virtual reality puzzle game code-named Entangled. This is a preview of On Nick Feffer, Undergraduate Design Fellow . Read the full post. Tiltfactor: Hi Spring! Can you tell us a little bit about who you are and what you do at Tiltfactor? Spring: I’m a Dartmouth ‘19, and I have been working at Tiltfactor on and off since my freshman spring. This is my 4th term working at the lab! I am currently an undergraduate fellow at the lab working on graphics, illustration, user interface, and user experience design. This means that I do a lot of the design work for layouts of what the screen looks like in our digital games, and I make decisions about how to draw the players’ attention to things they need to look at in order to have a good time in the games. This is a preview of On Spring Yu, Undergraduate Design Fellow . Read the full post. In February, Tiltfactor director Mary Flanagan was honored to be invited to Dubai by the organizers of the World Government Summit and the creative leadership group THNK for the UN/OECD-based Sustainable Development Goals (SDGs) In Action workshop at the annual World Government Summit. Mary presented the group findings on industry goals, along with government ministers from around the world as an invited guest. This week we lost a true great philosopher-king of play: Bernie DeKoven, who passed away in Indiana on Sunday. Founder of “The Games Preserve,” a game retreat center in Pennsylvania, he then went on to become involved in the New Games Movement, a 1970s collective that focused on physical and cooperative play to encourage dialogue and move away from competitive conflict resolution. During the Vietnam War, this movement stood out as having underlying political themes, and the games developed reshaped consciousness in a positive way. Bernie became the director of the New Games Foundation which created highly influential training programs as well as The New Games Book. Bernie “Blue” DeKoven brought his unstoppable brightness to his work as an organizer, trainer, thinker, writer, and activist. He impacted so many lives, including mine on both a personal and professional level. This is a preview of Remembering Bernie DeKoven . Read the full post. We are excited to launch our online adventure game, Crowded Dungeon! Designed by Tiltfactor with development by Producto Studios, Crowded Dungeon at first seems like a traditional ‘dungeon crawl’-style game. The player directs a hero through many rooms of a very crowded dungeon, frequently encountering monsters that bar her way. 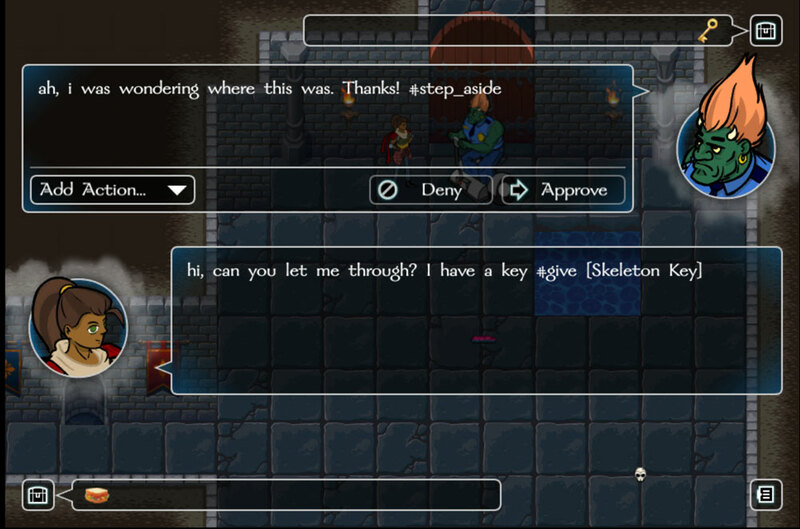 Unlike traditional games, instead of fighting the monsters, players must talk their way past them; you’ll need to figure out what each monster wants, and figure out what you can type to convince them to let you pass. This is a preview of Tiltfactor Launches Online Adventure Game, Crowded Dungeon . Read the full post. Our new article in Psychology of Women Quarterly describes a set of studies that examined the influence of gender on how individuals make emotional attributions. 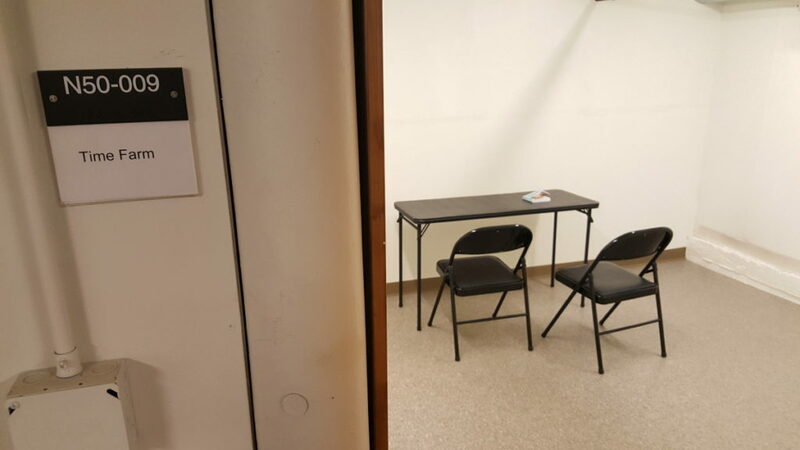 Specifically, we had participants read a narrative about a female character dealing with negative emotions such as anxiety or doubt in the context of a STEM class. We then asked the participants why the character was feeling those emotions. Across three studies as well as an internal meta-analysis that examined the pattern across the studies, we found that men and women sometimes differ in the way they make attributions in this context. The male participants were more likely than the female participants to think that our female character felt anxiety and doubt in her STEM class because she was not adequately prepared. On the other hand, the female participants were more likely than the male participants to think that our female character felt anxiety and doubt because of the effects of stereotype threat and awareness of bias. This is a preview of New Article! Gender, STEM, and Emotional Attributions . Read the full post.